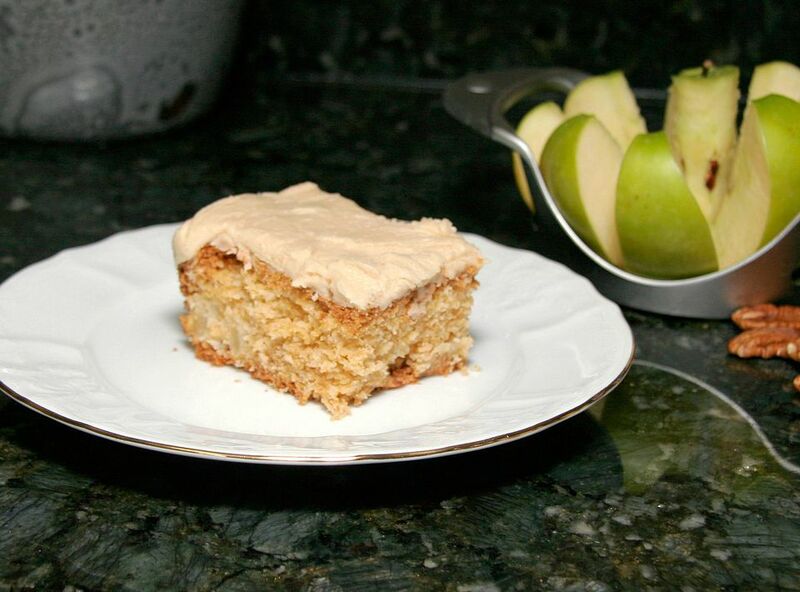 Make this homemade apple cake with chopped or grated fresh apples and lots of chopped pecans. Brown sugar, confectioners' sugar, and butter make a yummy caramel flavored frosting for this moist, delicious cake. Feel free to use chopped walnuts in the cake if you'd like. This basic vanilla frosting is another option for the cake, or top it with cream cheese frosting. Use a neutral flavor oil in the cake, such as canola, corn oil, or safflower. Lightly grease a 9-by-13-by-2-inch baking pan and then line with parchment or wax paper. Grease the paper. Measure the vegetable oil into a large mixing bowl. Add the granulated sugar and eggs. With an electric mixer on low speed, beat until creamy. Beat in vanilla. In a separate bowl, combine the flour, salt, baking soda, and baking powder. Add the flour in small amounts, beating well after each addition. When all flour has been added, or when batter becomes very stiff, remove the electric mixer and begin stirring by hand. Fold in chopped pecans and chopped apples. Spoon the batter into the prepared baking pan and spread evenly. Bake for 45 to 55 minutes, or until a toothpick comes out clean when inserted into the center. Let the cake cool in the pan for 5 minutes. Carefully loosen edges and turn it out onto a cake rack, remove wax paper, cool and frost. In a saucepan, combine the butter and brown sugar together; place the pan over medium heat and cook until the sugar is dissolved, stirring constantly. Remove the pan from the heat; add 3 tablespoons milk and 1 box of confectioners' sugar. Beat and add just enough milk to spread.